"WE SHOULD BUILD A BOAT TOGETHER." This is something my grandfather and I started saying to each other about 20 years ago. It started out as a big sailboat idea. But over time, the size of the boat got smaller and smaller, as my grandfather and I got older and older. 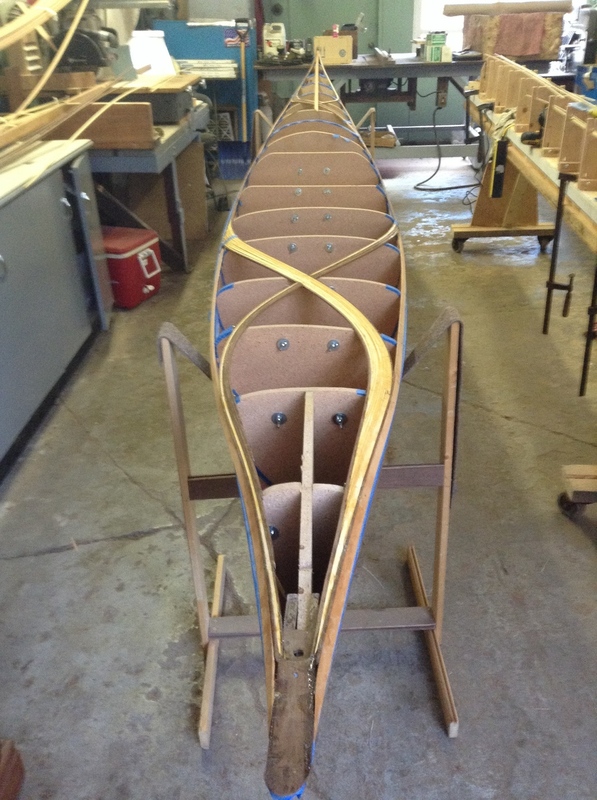 After my mother died of cancer, I decided that wasn't waiting for life anymore, and that I wanted to build a kayak for myself now. My grandfather was a woodworker for part of his career, so we decided to work on it together. Unfortunately, I waited a few too many years, and as I began the project, my grandfather's health began to decline. He'd still sit in a chair some days and watch me, but his help was pretty much limited to yelling at me, and telling me I was doing it wrong. Good times! For two years I would travel to Ramsey New Jersey, to my grandfather's house to visit and work on the boat. 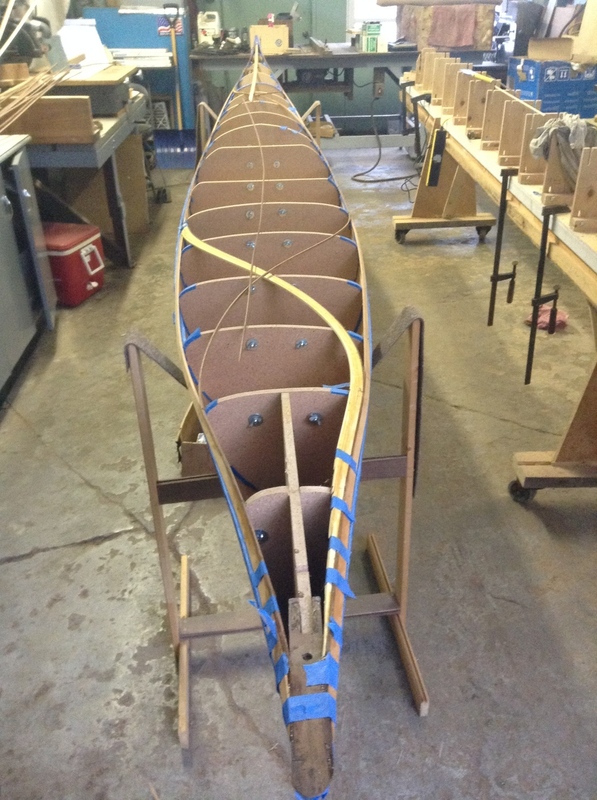 In 2014, my grandfather died, but I will finish the boat his year in his honor. 444 was my grandfathers address in Ramsey for over 50 years. 444 in numerology refers to a special spirit looking over you and your life. 444 is the number of miles in the Susquehanna River from headwater to Chesepeake Bay. I'll be doing the full Susquehanna River this year, and I'll dedicate that trip to my Grandfather. Hopefully, he will enjoy looking over me and the "444" on our journey. Set up the strong back and forms. Me and my grandfather together in a rare photo with the rest of my immediate family. This was a nerve racking first real test. In retrospect, this was one of the fast moving sections. 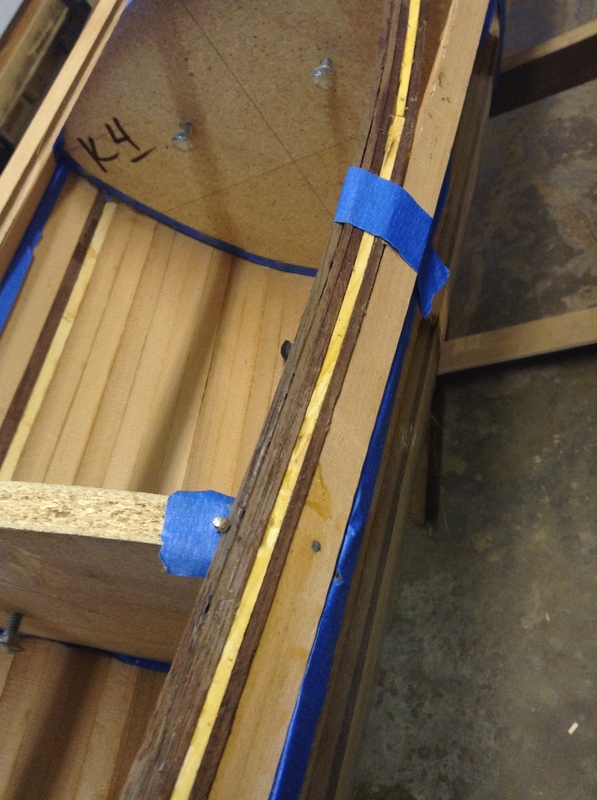 3/4 view of the beginning of the stripping. Just a view of how it's looking. 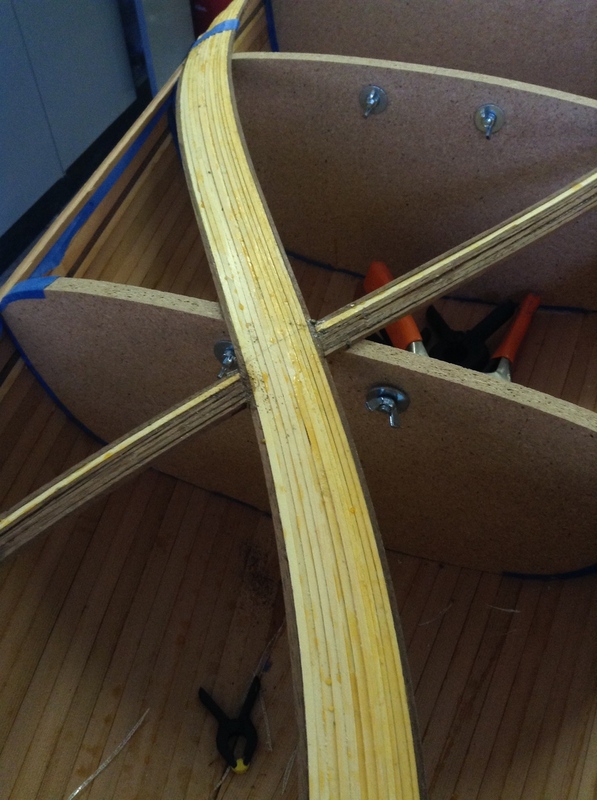 Full pieces for the whole boat: bow to stern. Each piece concave and convex edges. 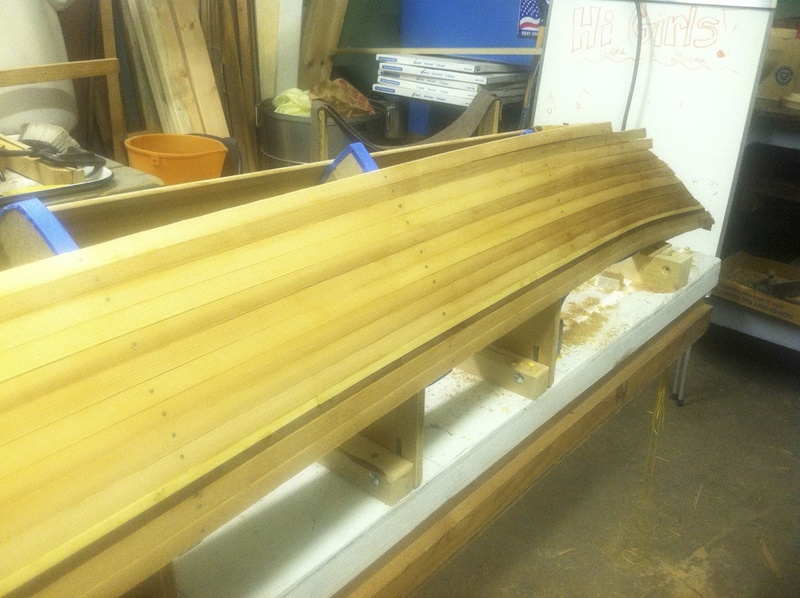 Nearing completion of the pieces that don't need long splice cuts. From here on in, I have to match the pieces to the other side. Making it start to all look nice. Sanding done and all the dust removed. 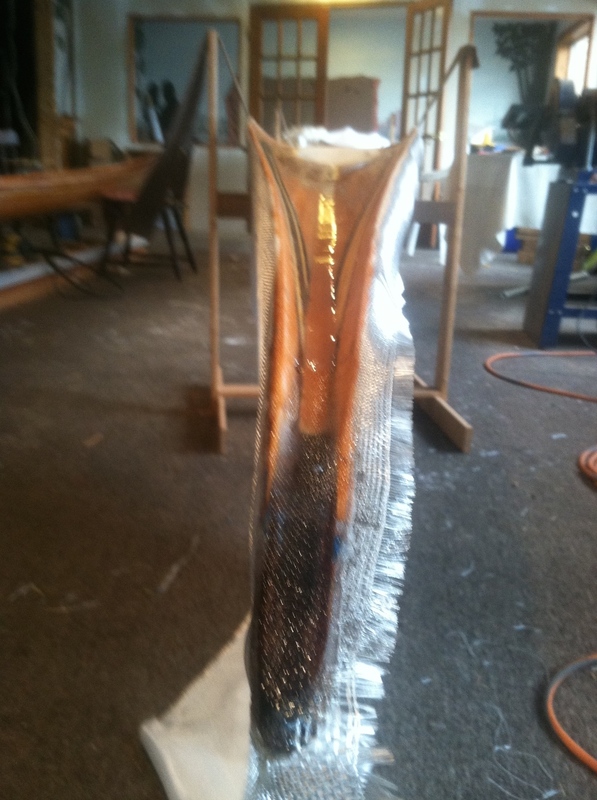 Fiberglass is epoxied to the wood. I kind of like the way this looks, but it needs another coat of epoxy for durability. You can still see the texture of the glass. Way more durable now. Ready to flip! The "444" becomes more than just an idea.